ITV weather presenter Sian Lloyd, 49, has married her fiancé 10 months after they met. She wed motor racing entrepreneur Jonathan Ashman, 59, in the Gwynedd village of Portmeirion, the setting for the cult 1960s TV series The Prisoner. She had been engaged to Welsh Liberal Democrat MP Lembit Opik before they separated in December 2006. The MP said he wished her well, but hoped she would "move on" from talking about their past relationship. The couple were wed on Sunday in front of guests who included actor Stifyn Parri and opera singer Bryn Terfel. Also reportedly there was former Prime Minister Tony Blair's son Euan, who is dating Mr Ashman's 19-year-old daughter Suzanne. Mr Parri said: "It was a small and beautifully-formed affair. There was a lot of laughter. We had a ball." "Because she's Lloyd and he's Ashman, I've started calling them the LA couple, " he added. Mr Parri, who represents her through his entertainments agency Mr Producer, added: "But she will be Sian Lloyd, she always will be." Ms Lloyd, who was born in Maesteg and grew up in Neath, now has a house in Montgomeryshire, in the constituency of Mr Opik, who is now in a relationship with Gabriela Irimia, one half of novelty pop duo the Cheeky Girls. Mr Parri, a former star of Channel 4's Brookside who has also appeared in Les Miserables in London's West End, said the bride wore a short cream dress and "looked fantastic". He added: "There were seven guests plus the bride and groom and it was a very Welsh, very tasteful day. "The wedding was between 12pm-4pm in a private room. There was no paparazzi, no fuss, and no nonsense." 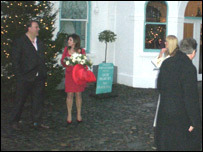 But while the paparazzi were missing, some photographs of the bride and guests were captured by passers-by. Coincidentally, as news of the wedding emerged, Mr Opik and his new partner were being filmed trying clay shooting for the first time at the Mid Wales Shooting Centre near Newtown, Powys. When asked about the wedding, he said: "I don't want to be rude, but Sian has spent an awful lot of the past 14 months talking about me and my relationship with Gabriela. "I hope now she's married, she will really be able to move on... she decided to end her relationship with me and I must respect that. "She has a new husband, I have Gabriela now I hope she'll wish me well as I wish her." The TV presenter met Mr Ashman about 10 months ago. He proposed last month while they were on holiday at the foot of Mount Kilimanjaro in Tanzania. It is thought the couple have signed a deal for their wedding to be covered by a magazine, and staff at the hotel were under strict instructions not to reveal the ceremony details. The couple divide their time between her home in mid Wales and Mr Ashman's mansion in Kensington, London.